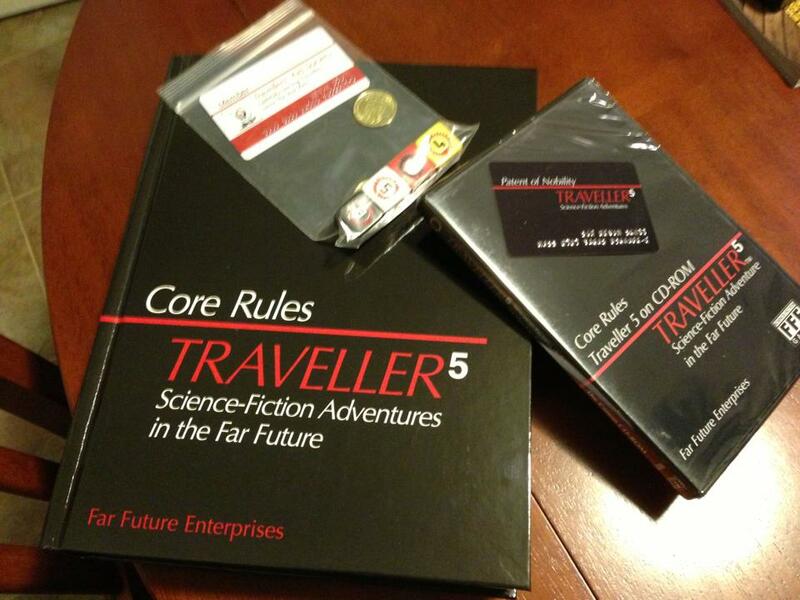 Traveller 5 finally arrived a year after the kickstarter began, and about 3-4 months late. It is an impressive achievement, and combines what normally would be several different volumes into one massive 656 page tome. TL;DR – The layout, editing, and clarity does not reflect how long this system has been in beta (years?). The dice turned out awesome. Ultimately, I’m a bit disappointed. This book does a few things very well. One of the most impressive is a system to create anything you can imagine. Each has a system depending on what you want to create: GunMaker, ArmorMaker, VehicleMaker, BeastMaker, even ThingMaker (something for creating devices or other equipment). There are also systems to create Starships and Star systems, but they have entire sections dedicated to them, and seem a bit more complex than designing gear. Graphics and illustrations are somewhat sparse, and tables abound giving it a very retro “wall of text” feel which, in my mind, should have been avoided. It makes it visually boring, and in some cases jarring, to read. To its credit, much like Pathfinder there is a rule for EVERYTHING. Good luck deciphering the acronyms once you find the appropriate table. I do enjoy the core mechanic of a difficulty number and having to roll under that on a certain number of dice. Often it is a combination of a characteristic plus a skill. The difficulty is set by how many dice you have to roll to stay under that number: i.e. 1d6 easy check, 2d6 moderate, 3d6 hard, up to 10d6 double hasty beyond impossible. I also like the idea of a flex result. Flex is 2d6-7, giving you a result anywhere from -5 to +5. This can be useful for determining the random result of something like current weather conditions, -5 being hurricane, +5 being ideally bucolic, or how much time a task takes. Changing a tire? That will take ten minutes, plus or minus 5, roll Flux. There are tons of tables, and even a table about tons that will have the math nerds squealing with joy, and thankfully distances are left a bit vague so we don’t have to bust out the protractors and rulers if it comes to a fire fight. Its a shame, really. I wanted to love this game, and eagerly anticipated it’s arrival. There are elements of it that are really compelling and may be excellent, assuming I can decipher enough of the rules to play a game. I just tried unsuccessfully to find a character sheet for this version of the game, and the card in the book looks like it was created in excel, with about as much visual interest. The dice they made for it are really cool, with vibrant colors, great graphics and nice weight. Overall, I can’t recommend purchasing this book. It’s a massive, expensive mess. Maybe the next printing will have more graphics, better layout, and additional proof-reading for both content and clarity. 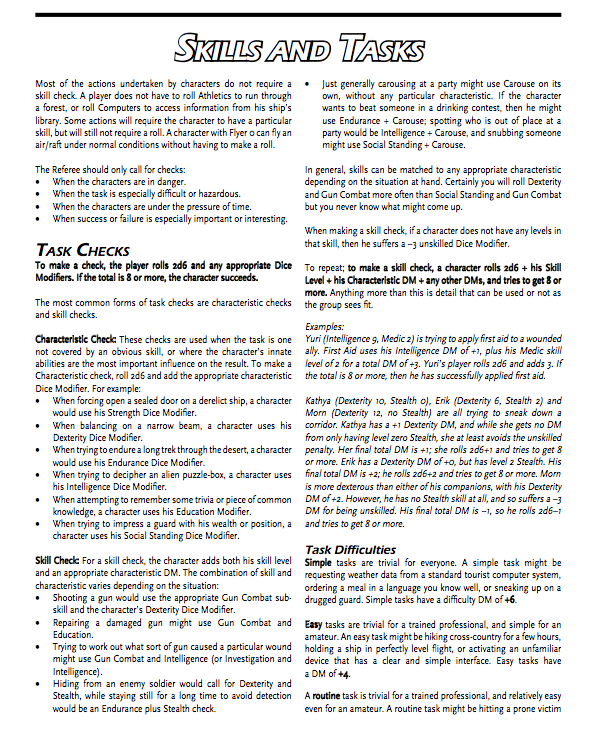 This chapter is excellent for those players who have run out of character ideas. Random tables cover everything from races and classes to siblings and love interests. New traits and feats are introduced and new drawbacks allow a character to add a third trait. It gives anyone the chance to flesh out your character more than ever thought possible. But the gem in this chapter (for me) is the Story Feats. Consisting of four parts (Prerequisite, Benefit, Goal and Completion Benefit), these feats give a benefit when taken and another when a sort of mini-quest is achieved. The feats cover everything from freeing slaves to building massive monuments. I think this is a very nice addition to regular feats that tend to just complement combat actions. Earning Cash should be the name of this chapter and it gives your character something to do while not clearing out the local dungeon or defeating that evil sorcerer in the next town. The system for earning capital is expansive and covers ways to build and hire minions with more than just using gold. A listing includes examples of rooms and buildings to build and hiring employees (thugs, clergy, etc.) to staff your creations. Random event table tied to buildings are also included. This chapter is sort of ‘numbers heavy’ but once you get it, it will be easy and have you prepared for more in Chapter 4. 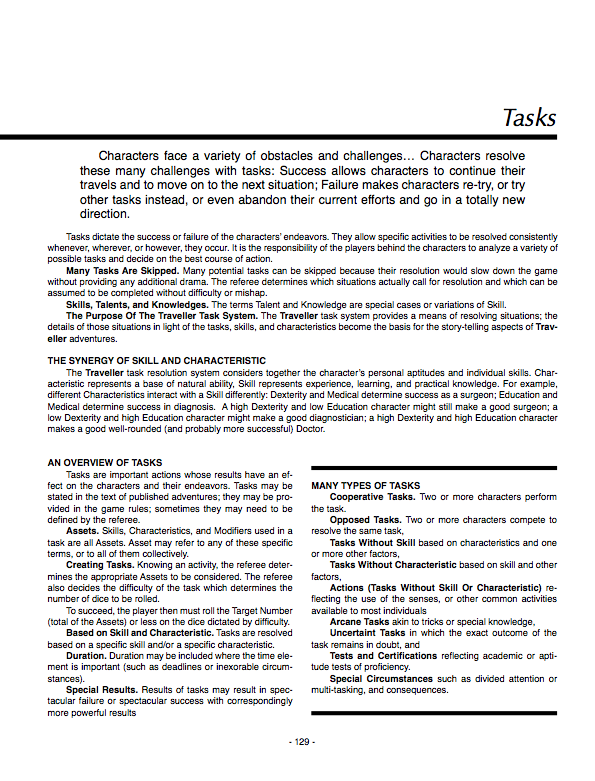 This chapter deals with many campaign-related issues such as alignment, companions and contacts. It breaks it all down and gives more detailed explanations than I expected. 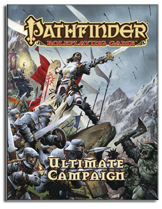 Other aspects offered is an honor, reputation and fame system reminiscent of the one used for the Pathfinder Society Organized Play fame and prestige system. An interesting aspect that interests me personally is the section on young characters. The question becomes what if you had a campaign that started when the characters were young and progressed all the way through old age? And that leads us to the all-important culmination that is Chapter 4. This chapter is basically split into two parts; Kingdom Building and Mass Combat. Kingdom Building takes aspects from Chapters 1-3 and combines them into the next logical progression, the kingdom. This sections takes you from the settlement phase (a step up from buildings in Chapter 2) and lets you expand your fledgling kingdom. This section includes ways to manage your kingdom through edicts and building points. Like Chapter 2, this can also be ‘numbers heavy’ but, again, once you get it, it is easy. There are also optional rules to extend your kingdom’s reach with diplomacy, exploration, trade and vassalage. This goes into how to deal with the fame or infamy of your kingdom and expansion beyond the kingdom’s borders. And it is when diplomacy goes bad that this takes us into the second part of the chapter; Mass Combat. This section covers army size, action phases and tactics. It also covers commanders and boons that they can confer onto armies as well as resources and special abilities that an army may use and possess. Examples of armies are also included. The fleet battle system in the Skulls and Shackles Adventure Path is a derivative of this section. All in all, this book is really well thought out by the Paizo staff and extremely informative and helpful. With the only drawback I can think of as being somewhat ‘numbers heavy’, I give this an enthusiastic 4.5 out of 5 stars! Check out last Monday’s article about Cooperative Summoning. Following the success of last month’s Thundersmoke, I wanted to go show more of the different ideas that can be done with party composition. With Thundersmoke I wanted to show how to expand the concept of what you could do with the gunslinger class by adding prestige and personality to player characters and how they relate as a party. So after attending CapeCon in Cape Girardeau, Missouri and playing with a dedicated team of cooperative clerics, I wondered about teamwork and what a party could do as a team. I thought about teamwork feats and what classes like the cavalier and samurai could do with them. But instead of granting the use of teamwork feats to fellow party members on a limited basis, what if they could be used on a regular basis with no limitations? The summoner class popped into my head because I have never really worked with that class before. And no other class should teamwork be evident than between a summoner and its eidolon. But take it a step further. What if a party of summoners used the same set of teamwork feats between them as their eidolons used a different set between them? After discovering a strange bronze amulet in a desert tomb, the scholar Chigaru Bomani set out to unlock the powers that he believed were contained within the amulet. It was fashioned into the shape of a deformed hyena’s head, but with half of it to look as if half of the face was melted. Two diamonds were set in its one eye and the amulet itself seemed to always feel cold. He traced its origins to a powerful cult of Lamashtu that wished to unleash a horde of yaenit on the countryside, which revealed that several other identical amulets were also created. From his research it seemed that the only difference between them was the different precious gems in the eyes. After unlocking the amulet’s power to summon a deformed hyena-looking creature and exhausting all of his research options in Osirion, he left to locate the other amulets. With each bit of information he could gleam from rumors, informants and the like, he traveled the Inner Sea region to find each amulet in the possession of another. After convincing the others to join him they ended up on the doorstep of the Pathfinder Society in Absalom. The Pathfinders sent them on missions to find out more about their amulets, and fund their research. When they were together they felt a certain kinship, and a surge of arcane power seemed to radiate from their amulets. The eidolons summoned by the amulets look like deformed one-eyed hyena-demons with gangly limbs some have referred to as yaenits. Somewhat disturbingly, they seemed to know each other. These creatures are misshapen, mutated quadrupeds with wicked teeth and claws and have fur coloration that corresponds with the gem in their summoning amulet. While creatures of Lamashtu, they seem to obey the orders of the bearer of the amulet unerringly. 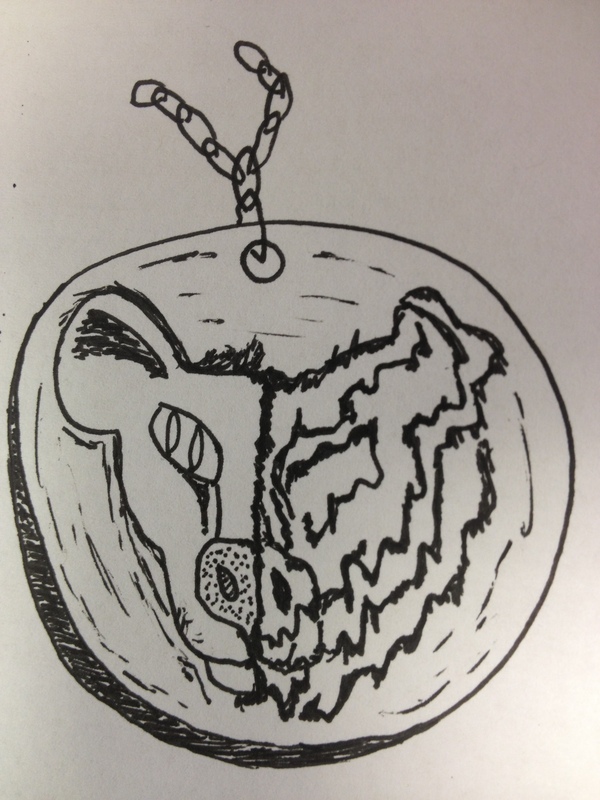 Questions do remain that the players can use for role play: Do the amulets contain all the arcane power? Will they work with other wearers? Has the power seeped into the characters without their knowledge? Will the yaenits always obey the wearers? Or what if a higher power calls; will they reveal their true nature? Now that we have established a background, it is time to get into the nuts and bolts of the party. First let’s tackle the summoners themselves. At first level they all receive the Allied Spellcaster feat, which, while adjacent to one another, gives better spell penetration and bonuses to spells known collectively. You will notice that they all possess the spell snowball that automatically becomes associated with the feat. This will definitely boost their offensive power as individuals. As they advance in level and gain more spells, the group should decide to take some spells together to gain the benefit of this feat. The other 1st level spell corresponds to their personality and secondary role in the party. Suggestions for future teamwork feats could be Shielded Caster or Shake It Off depending on what defensive qualities the player or party decides is most relevant. Or maybe the Extra Evolutions feat would help to boost the yaenit’s abilities. Now let’s look at the yaenit eidolons (Character Sheet). Their first level eidolon abilities will be claws, pounce and improved damage (claws). They will receive the Precise Strike team work feat at first level which will give them a bonus die to damage with each melee attack that hits to a creature they flank. With three attacks a round, the damage could add up quickly. Future teamwork feats could include Paired Opportunists, Outflank, Tandem Trip and Coordinated Maneuvers or possibly Power Attack (recommended for third level) for a damage boost. Those feats should depend on the eidolon abilities that the players choose for their yaenit. Abilities that should be considered at third level are grab (bite) for those who like to enlarge their yaenit or trip (bite) to slow fleeing foes down. At fourth level rake becomes available, but the yaenit must be grappling the creature before he can use that ability. At fifth level, energy attacks become available which will boost offense to all of its natural attacks. And then at sixth level, rend becomes available for another offensive boost. Unfortunately, these are all 2-point abilities, so players will have to be savvy with their use of available points or take the Extra Evolution feat. It should be noted that they yaenits do not have to all be the same at this point, but should spread the abilities and teamwork feats between several of them to get the most use out of their abilities. As the creatures individually develop at the whim of the summoner, the possibilities for role play are endless for this party. The party members are listed below. Click on their name to see their character sheet and their secondary party role is listed in parenthesis. All are summoners, but can fill the role of the other class through skills and abilities. Also included is the way that they acquired their amulet. Here is the level 1 eidolon. I’ve been a fan of Kobold Press, and Wolfgang Baur’s work in general for several years now, but this was the first Kobold Press book I purchased that was not part of a kickstarter. 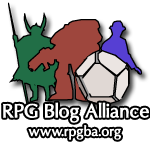 The TL;DR of it is this: If you are looking for system-neutral guidance on creating your own world for use in an RPG, or even writing a novel, this is a fantastic resource. 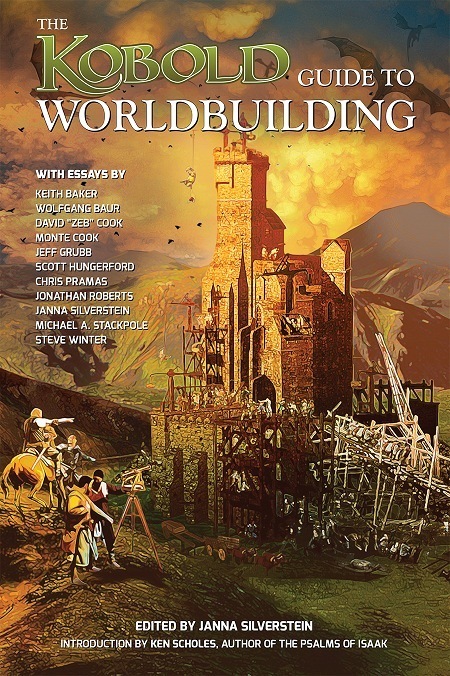 This book features an all-star list of contributors such as Keith Baker (creator of Eberron), Monte Cook (most recently, creator of Numenera), Chris Pramas (Green Ronin Publishing), other old-guard TSR luminaries such as Jeff Grubb, David “Zeb” Cook, and Steve Winter, Kobold-in-Chief Wolfgang Baur, and my favorite fantasy cartographer Jonathan Roberts. The full list is on the cover of the book. The digest-sized book weighs in at 124 pages. The price at $19.99 seemed a bit steep, but I was willing to give it a go due in large part to the list of contributors, and I was not disappointed. The layout is appealing with essays broken up by subtitles and sidebars, with only a few illustrations as necessary (i.e. the cartography article). Each essay deals with a different aspect or approach to world creation, often detailing common pitfalls and approaches to consider. Some of my favorite articles are Chris Pramas’ “World Building Inside Out and Outside In,” which explores the pros and cons of adding details as your heroes explore the world, or establishing big-picture elements of the world and how that affects the heroes’ current situation. I also really enjoyed “Here be Dragons: On Mapmaking,” by Jonathan Roberts. It spoke to not only how rivers and mountains should work on a map (rivers generally join, rarely branch and flow out to sea), but also more abstract mapmaking between nations or world powers. What is each nation known for? What are their relationships with their neighbors (trade, war, isolationist)? Another one of my favorites was “How to Write a World Bible,” by Scott Hungerford. I was surprised to find this near the end of the book, as to me it seems like such a great jumping-off point for so many of the other articles. It just touches on considering the over-arching concept of the world, the races, technology levels, currency, pantheon, cartography, notable figures (NPCs) and terminology. If I were to organize this book, I would have had this article a lot earlier, with page numbers to other articles that go in to more detail about each subject. All and all a fairly minor gripe, in what overall is an outstanding resource. It should be noted that included in the $19.99 price is not only the print, but also a PDF copy. Very convenient for those of us who like to keep our books on tablet-computers for reference. That certainly sweetens the deal, and is something I wish Goodman Games would do, when I purchase DCCRPG modules. In conclusion, if you are of the mind that published adventures and worlds are for newbies and lazy gamemasters, this will help you flesh out the world you want to create and make it so compelling your players will never want to adventure anywhere else!